The Iranian cinema has gained a lot of experience regarding various aspects of producing war films. However, since some issues related to Iran-Iraq remained untold and due to lack of diversity in approaches taken by filmmakers to some issues and wartime memories, which called for more cautious treatment, those films were frequently restricted to specific limits. Throughout the history of the world cinema, war films have been made for propaganda purposes and most of them give an exaggerated picture of enemy soldiers who are portrayed in the most wicked and evil way. On the other hand, friendly forces are shown as legendary heroes with all their positive characteristics. After the World War II and Vietnam War, although cinema and arts circles despised the war, the same approach continued in the most subtle form. That experience has been also repeated in the Iranian war cinema during the past years; that is, while depicting friendly forces as heroes, enemy forces have been humiliated. Friendly combatants have always been cast as pious, serious, courageous, perfect, and sometimes mystic persons while enemy forces have been shown as ruthless, fool, blind, coward, and imbecile thugs. The Iranian war cinema never condemned war, but glorified it and, thus, it was described the “Sacred Defense Cinema.” Therefore, no film was made to condemn war or prove that it is meaningless or that combatants are ordinary people with ordinary weaknesses. On the contrary, they were cast as heroes and much significance was attached to heroism, sacrifices and martyrdom. Post-war problems and the situation of warriors has been one of the main concerns of the Iranian war genre during past years. 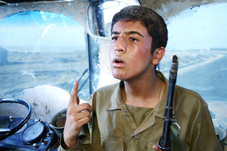 In The Glass Agency (Hatami-Kia, 1997) we see a Basiji combatant called Abbas who has been farming in a small village after the end of war while still carrying a mortar shell shrapnel in his body near a main artery. His wife insists on him to go to Tehran for treatment and he comes across Kazem, one of his old combatant friends who had been his wartime commander. Kazem is transporting passengers with his own car to make a living. The doctor says Abbas is in critical conditions and recommends that he should be treated overseas to have the shrapnel removed from his body while advising him to be less nervous. To fund his friend’s trip, Kazem accepts to sell his car, which is his sole source of income. When at travel agency, the buyer of the car does not provide the money on time and Kazem proposes to the man in charge of the travel agency to keep the car’s switch and documents as collateral until the money arrives. The man refuses and a scuffle ensues. Kazem becomes angry and takes the agency’s customers hostage and the adventure continues in a different way. Critics have taken different approaches to the film. Some of them have approved of or even lauded the professional structure of the film, but have described it as promoting violence and disrespect for law through a sentimental and even destructive logic and have even construed it as a sign of internal conflicts between political forces in the Iranian ruling system. The film can be analyzed from many angles and does not follow a stereotyped storyline. The Glass Agency is a multilayer work of arts and any person or group relates to it on the basis of what they understand from it. The film takes a sociological look at the current social approach in Iran and the trend through which behaviors as well as human and corporate relations takes shape. In fact, the film takes a sociological look and moves from upper social classes down to lower layers and tries to find root causes. In that film, various dimensions and aspects of the modern Iranian society have been portrayed and social conflicts are reflected in it. If due attention is not paid to those conflicts and good solutions are not found for them, they can easily damage social structures and human relations in our society. On the one side, The Glass Agency maintains that the society needs logical laws and regulations (legal measures taken by Kazem before hostage taking), while on the other hand, it cannot be indifferent to the cause for which a brave generation has laid down its life.